The analysis in this report is based on telephone interviews conducted May 5-June 7, 2015, among a national sample of 5,122 adults, 18 years of age or older, living in all 50 U.S. states and the District of Columbia (1,800 respondents were interviewed on a landline telephone, and 3,322 were interviewed on a cellphone, including 1,945 who had no landline telephone). The survey was conducted by interviewers at Princeton Data Source under the direction of Princeton Survey Research Associates International. A combination of landline and cellphone random digit dial samples were used; both samples were provided by Survey Sampling International. Interviews were conducted in English and Spanish. Respondents in the landline sample were selected by randomly asking for the youngest adult male or female who is now at home. Interviews in the cell sample were conducted with the person who answered the phone, if that person was an adult 18 years of age or older. For detailed information about our survey methodology, see https://www.pewresearch.org/methodology/u-s-survey-research/. 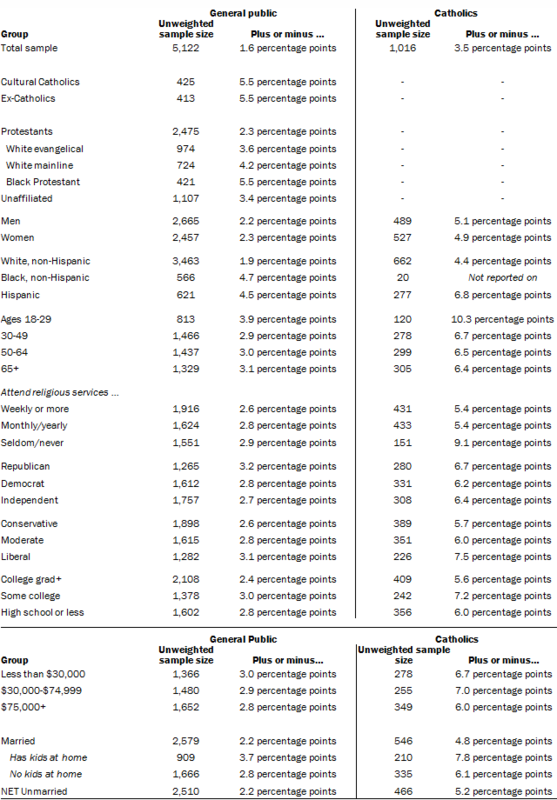 The combined landline and cellphone sample is weighted using an iterative technique that matches gender, age, education, race, Hispanic origin and nativity and region to parameters from the 2013 Census Bureau’s American Community Survey and population density to parameters from the decennial census. The sample also is weighted to match current patterns of telephone status (landline only, cellphone only or both landline and cellphone), based on extrapolations from the 2014 National Health Interview Survey. The weighting procedure also accounts for the fact that respondents with both a landline and a cellphone have a greater probability of being included in the combined sample and adjusts for household size among respondents with a landline phone. The margins of error reported and statistical tests of significance are adjusted to account for the survey’s design effect, a measure of how much efficiency is lost from the weighting procedures.